Shoes and love go hand in hand. Shoes don't care who wears them- they just want to be worn. No matter who you are, everyone needs to wear shoes. In celebration of their fabulously revamped, fifth floor shoe heaven, Barneys has partnered with the Human Rights Campaign (HRC). The HRC is working towards Lesbian, Gay, Bisexual, and Transgender equal rights. Barneys and the HRC have created a facebook contest entitled Perfect Pairs: The Love Letters. To enter, you first must "like" BarneysNY on Facebook, which will grant you access to the contest page. Then share your love story (be it a love of shoes, a whirlwind romance, or a combination of the two) on their page. The winner will recieve a $5,000 Barneys New York gift card, and their story will be featured on Barneys main site and Facebook page. Even if you don't win, you will still be contributing to the cause because for every love letter submitted between July 16 and August 3, Barneys will donate $1 to the HRC. And as if you needed any excuse to go shoe shopping, 10% of sales from any shoe you purchase between July 16 and 22 on the new floor will go to the HRC. 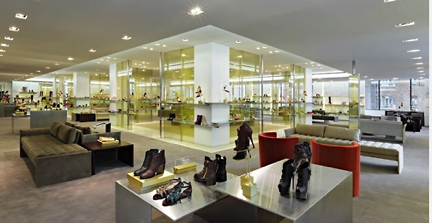 There really is no excuse not to explore Barneys new bright and airy fifth floor redesign. Buy some shoes, support a good cause. What could be better?